Beside the Microwave Contest beginning of June the month was not very spectacuar at all, when talking about 10 GHz. Temperatures were not that hot to build up very high clouds and activity outside the contests is normally quite poor. Worked F6DWG/p (JN19AJ/649km), DL1ATI (JO50), DL3IAS (JN49) and DL3IAE (JN49). Worked F6DWG/p (JN19AJ/649km), F8DLS (JN19SE/564km) and DL5EBS. Heard but not worked OZ7M. Beacons heard: LX1DB (JN39/376km), ON0EME (JO21/399km), OE5XBM (JN78/447km), OK0EA (JO70/379km), OK0ET (JO70/366km) and SR6XHC (JO80/465km). During the afternoon some hotspots were formed in southern Germany. Very glad to work again with Giorgio, IK3GHY (JN65DM/688 km). Heard but not called were DB6NT and DL1ATI. 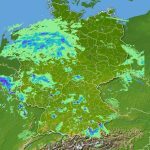 Massive rainshowers crossing Germany during the day. Activity low like usual. Worked: OK2DL (JN79/445km), OK6TW (JN89/498km), OK1FPR (JO80/427km). Beacons heard: OK0EA (JO70/379km), SR6XHC (JO80/465km). Being active just on 10 GHz during Microwave Contest means having a quite weekend, but not this one. The weather was mostly cloudy and thunderstorms from the west spreaded across Germany, especially in the afternoon. Right at the beginning of the contest and until the evening the band was crowded with stations. Some OK2 and OK3 stations were heard over hours with strong scattered signals. Sunday was just the opposite, probably because of the Pentecost day. Happy to work DL9GBH/p from JO72AK for square # 59. Results: 13.635 points (350 km/QSO avg. ), 39 QSO’s, 6 DXCC and 23 squares. Beautyful weather and temperatures up to 31° C offered the first nice openings on 10 GHz via Rainscatter this Sunday, Monday and Tuesday afternoon. 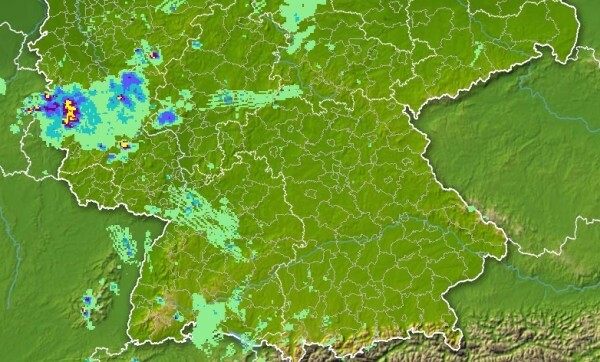 May 28: On Sunday a very stable rain cell near the Belgium/Luxembourg border made contacts possible with F6DKW (JN18CS/ 671km), F8DLS (JN19SE/ 564km) in SSB, ON5TA (JO20ES/ 440 km), F5DQK (JN18GR/ 653 km) and finally DL3IAE (JN49DG/304km) . Best beacons: HB9BBD (JN49GA/528km), LX1DB (JN39CO/376km). May 29: Monday afternoon followed with several hotspots covered across south-western Germany. Worked F8DLS (JN19SE/564km) in SSB, F6DKW (JN18CS/ 671km) and DH1VY (JN39) also in SSB. May 30: Another hot day! Tuesday afternoon strong thunderstorms crossing mid Germany. QSO with DL3IAE (JN49), heard among others OE5VRL/5 in SSB and FM. Best beacons: HB9BBD (JN49GA/528km), OK0EA (JO70UP/379km). May 19, 2017: OE5VRL/5 (JN78), DM2TO (JO61). May 12, 2017: DH1VY (JN39), DR60VKL (JN39), DF9ZT (JO40), DL7HM (JO40), DL1RTD (JN59), DL3IAE (JN49).